light « What will I cook today? Farro is a grain similar to barley, but a larger and chewier–I like it better than most other “grains” like bulghur, barley, rice, and quinoa due to its more substantial texture. This was my first experiment in cooking farro, a bag of which I got as a gift from my friend Athena, fellow food connoisseur and cook. I prepared it similar to risotto in that broth was added bit by bit until it was fully absorbed. This dish is, according to the original author, inspired by a Moroccan porridge called herbel, which is sweet as it uses cinnamon and milk. The dish below is definitely savory and a perfect light lunch. In a large nonstick saucepan, melt 3 tablespoons of butter. Add the sliced scallions and cook on medium heat until softened (2 minutes). Add the farro, season with salt and pepper (omit salt if using high-sodium broth) and cook the farro in the butter/scallion mixture for 1 minute (to toast it). Add the broth, half-cup by half-cup, slowly, allowing the farro to absorb it all before adding the next aliquot of broth; stir frequently but not constantly. This will take about 30 minutes. Remove from heat. In a large skillet, heat olive oil and then add cauliflower; season with salt and pepper. Cook over high heat until tender and browned in spots (about 5 minutes). Add the cauliflower to the farro mixture and toss, as well as the vinegar and the remaining butter. Divvy into four bowls. Poach the eggs: Crack the eggs into small bowls. Bring a shallow pan of water to a rolling boil. Add white vinegar to the water; vinegar keeps the egg whites from spreading too much. Add each egg into the pan carefully and cook for three minutes. Remove with a slotted spoon, and place directly on top of the farro in each bowl. Garnish with fresh scallions. This was pretty easy to make and very satisfying. I used the 10-minute farro, which may have changed the texture of the resulting product; I think risotto is supposed to be creamier. 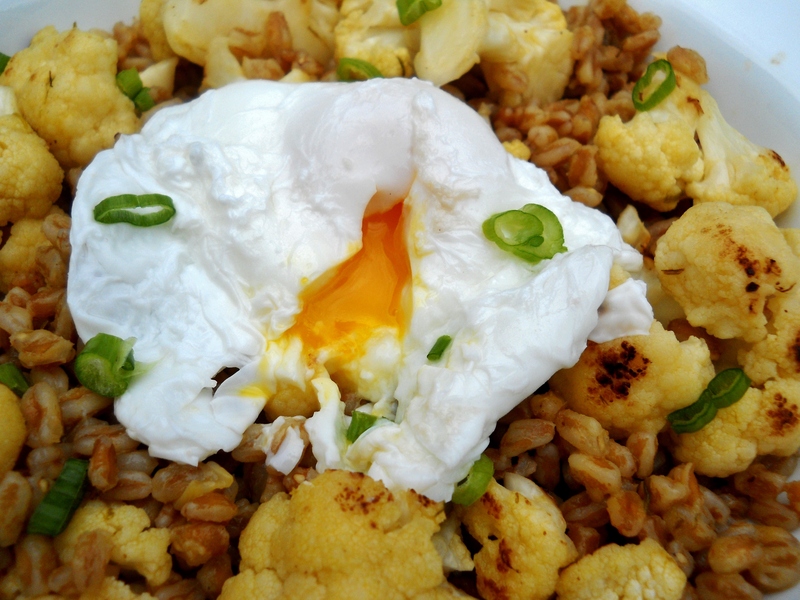 I would like to try cooking regular farro and see if there is a difference. 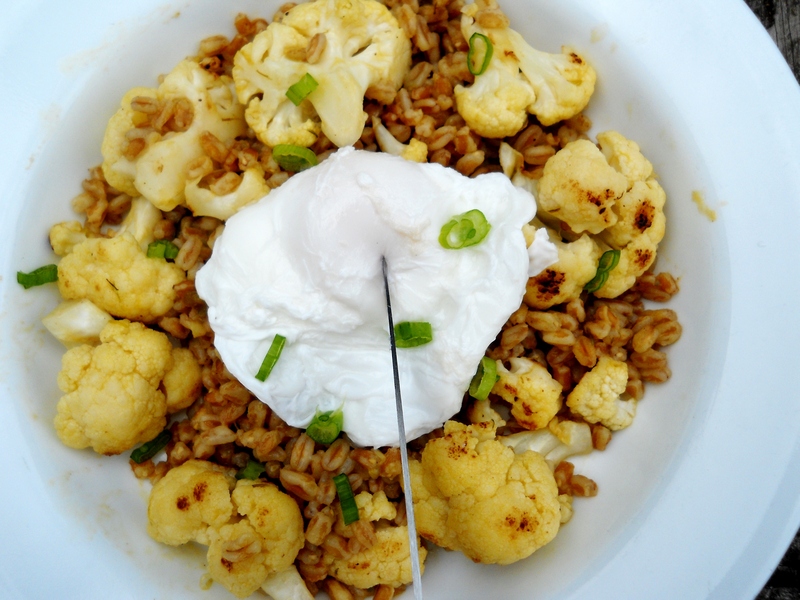 The red wine vinegar cuts through the buttery farro and rich egg yolk, and the sweetness of the browned cauliflower offsets the savory scallions. I really love eggs with a runny yolk… something about them, it just tastes like the elixir of life (which, it kind of is). This meal is super protein-packed and a great post-workout dish. The dish is vegan besides the egg, and can stand up without the egg if necessary. If I make this again, though, I’ll definitely add some more veggies such as broccoli and/or peas for color and flavor. 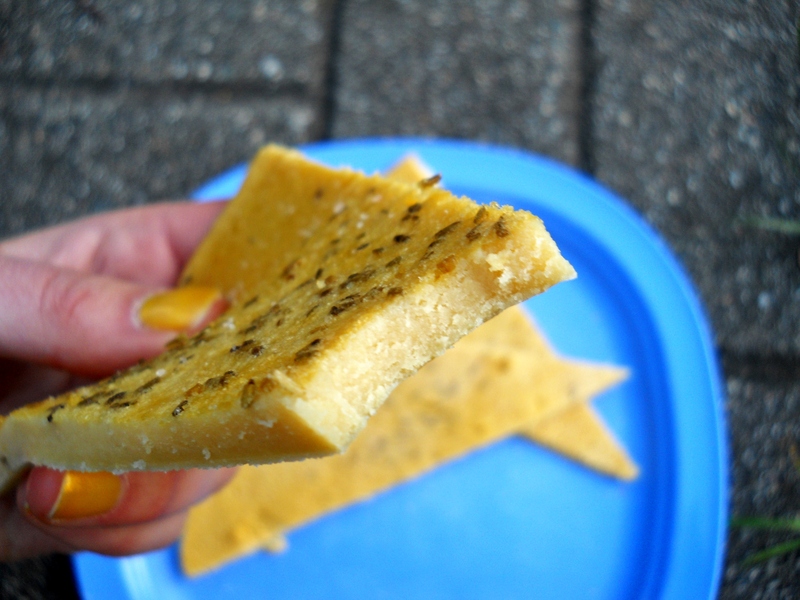 Light, satisfying, full of protein and extremely easy to make! 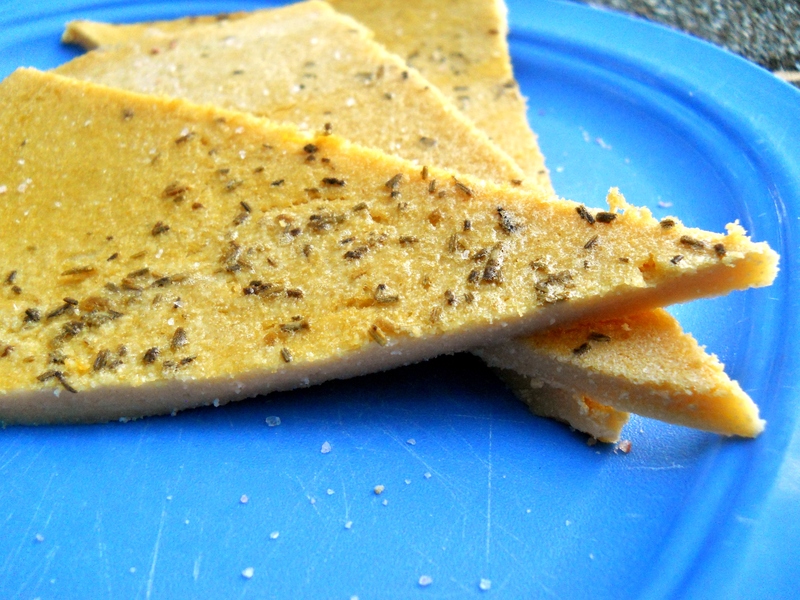 Just chickpea/garbanzo bean flour, water, a little olive oil and seasonings. Put chickpea flour in a bowl, and whisk in the water. Add oil, mix, and spices and whisk until there are no lumps. Let sit for at least 3 hours or overnight. Oil a rimmed baking sheet and preheat the oven to 350°F. Pour the batter into the pan to make one 1/4 inch thick layer, and carefully place in oven. Bake for at least 30 minutes, maybe more depending on the size of your pan and desired golden brownness. You can broil for a few minutes to get a crispier top too! Let cool and slice up. These were yummy, although I think baking a bit longer would have been a good idea. Definitely a win with using rosemary and garlic. These can be eaten as bread for a sandwich or spread with guacamole. If you’re feeling snackish, I would suggest eating warm or warming these up in the toaster (convection oven). My dad actually ate hummus on top of his flatbread. Chickpea overload! 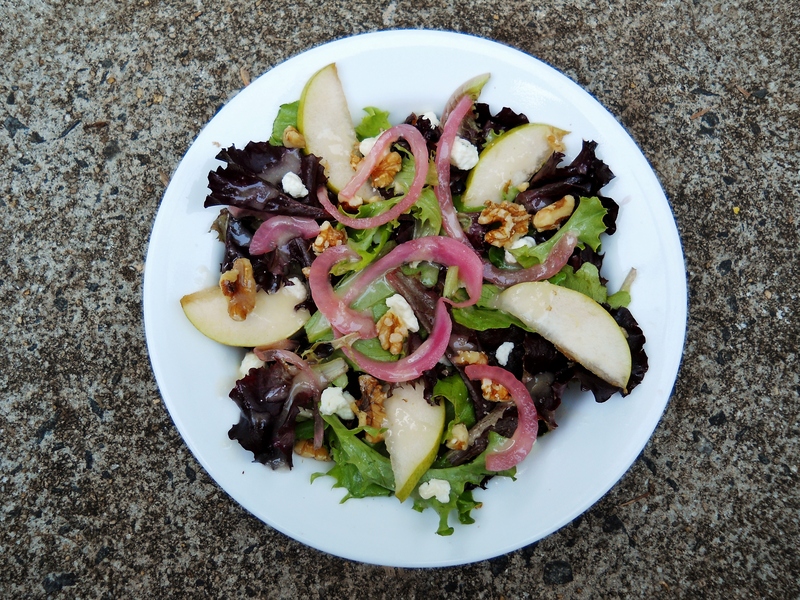 While lacking in color contrast, slightly under-ripe pears make a great substitution for apples in a Waldorf Salad. 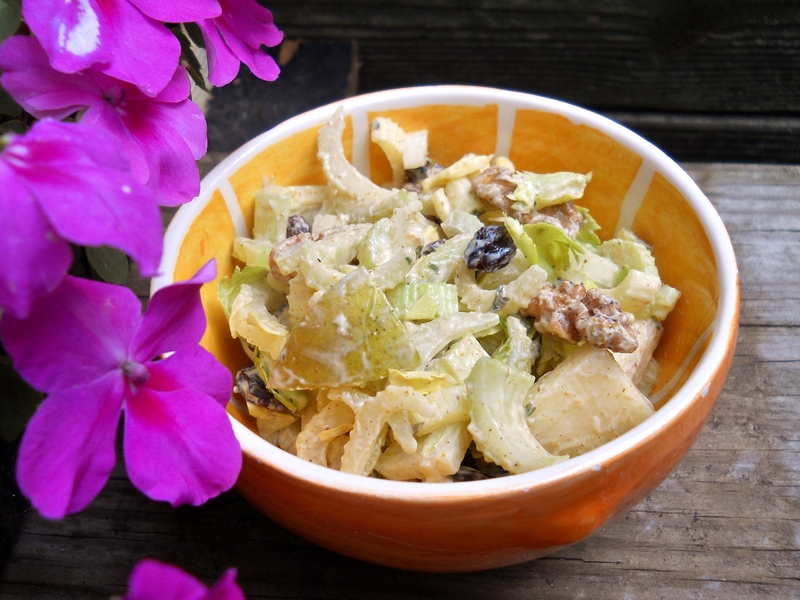 Do not be fooled by looks, for crunchy celery + toasted walnuts + sweet pears + chewy raisins + a spicy mayo/yogurt dressing to hold it all together are a definite treat to the palate in terms of flavors and more so, textures! Combine the lemon juice, yogurt, mayonnaise, curry powder, cumin, and salt. Set aside. Mix together the remaining ingredients and smother with the dressing. Couldn’t be easier! Besides the tedious task of chopping stalk after stalk of celery. But I loved this different take on the Waldorf salad–I’m getting into spicier food lately (I have had a craving for Indian food since last summer, basically) and I loved the toasted walnuts together with the pears (classic combination) and the tangyness of the yogurt and mayo. Plus, all of the celery is used, even the leaves! Kudos for less food waste! I got Sheryl Crow’s new cookbook, If It Makes You Healthy from the library and was perusing the recipes. They all looked pretty tasty. I wasn’t sure what to try. When in doubt, ask someone else what looks good! My dad decided on this salad. 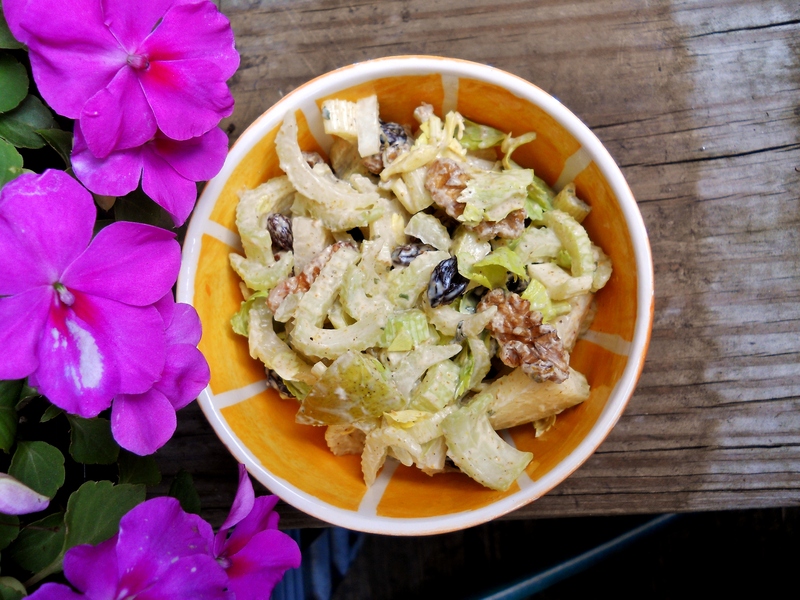 It contains many of his favorite elements: blue cheese, red onions, walnuts. Plus, I got to try a few new ingredients and cooking techniques like pickling. I’d never heard of champagne vinegar — but it is quite good and very champagne-y. Plus I discovered I actually like the taste of moldy cheese. Who knew? In a large mixing bowl, toss the mesclun with about 1/4 cup of vinaigrette, then divide the greens among 4 plates/bowls. 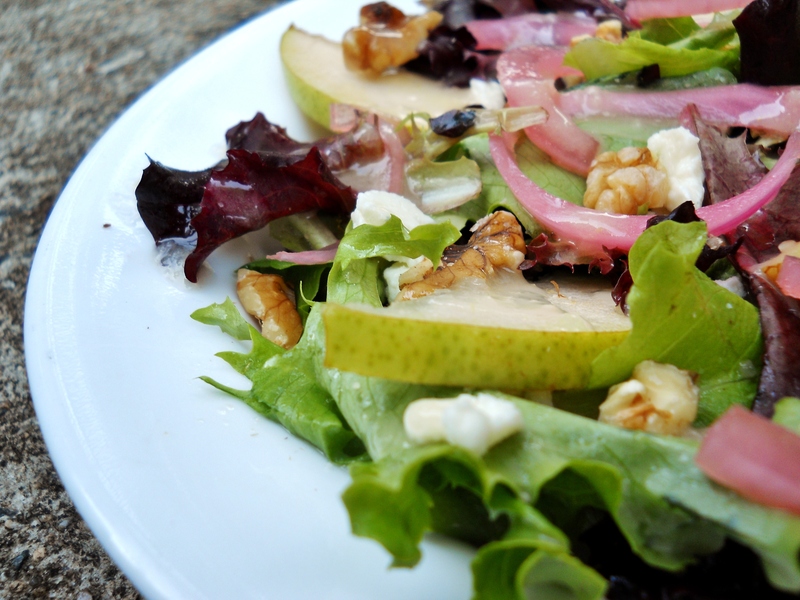 Lay 5-6 slices of pear on top of the greens on each plate, then sprinkle on some walnuts and blue cheese. Finally, place some pickled red onion on in a visually appealing fashion. Drizzle on more vinaigrette and serve. 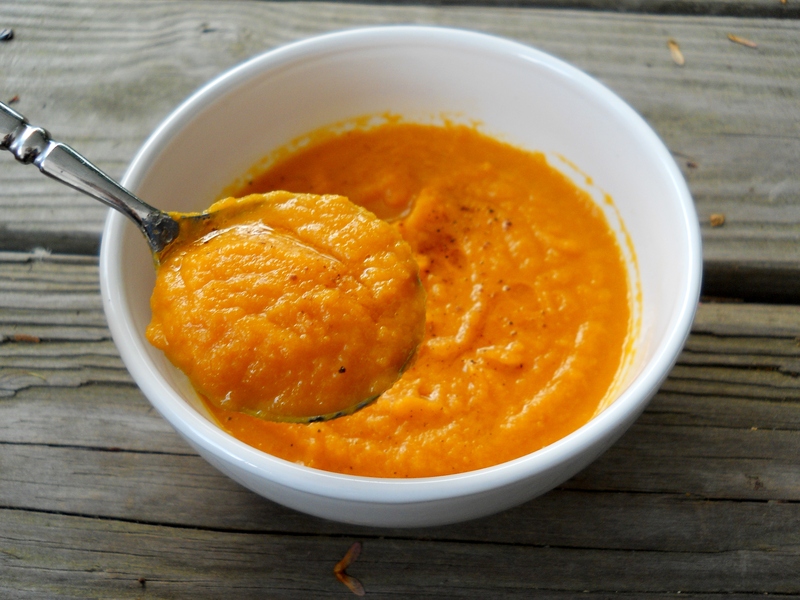 Using a blender or food processor, blend the vinegar with shallot, mustard, honey and garlic powder until just mixed. Put the blender on medium speed and slowly drizzle the oil through the tube while it runs, until the vinaigrette is emulsified. Add 1 teaspoon of water at a time if it seems to thick; but I didn’t have to do this. Season with salt and pepper, and use immediately or refrigerate (shake/whisk before using). Place sliced onion into glass/ceramic/nonreactive bowl large enough to hold the onions plus, later on, the pickling liquid. In a small saucepan, combine 1 cup water with vinegar, salt, and sugar, and bring to a boil over medium-high heat. Once boiling, pour over the onions, covering them. Stir and let stand for 4 hours at room temperature. After 4 hours, cover and refrigerate until ready to serve. This salad was really yummy, especially the champagne vinaigrette. The pickled onions were a little strong for me, but if you are like my dad who loves jalapeno peppers and/or hot seeds on everything, you’ll probably like them. I didn’t bother to toast the walnuts… Okay, truth, I tried toasting them in a skillet and then forgot about them, leaving me with lovely burnt walnuts… so, I decided to use raw. All of the various ingredients really complement each other. This meal would especially be good with fresh picked baby lettuces from your garden, if you have one. Yay for being home from school! Yay for first trip to Costco in months! 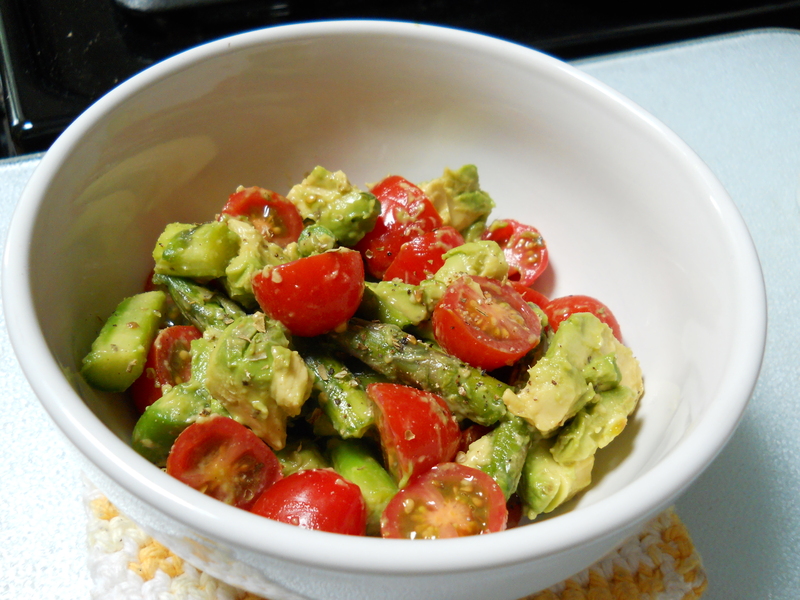 Yay for having avocados, asparagus and cherry tomatoes in bulk! Boo for not realizing I didn’t have basil. But this was still delicious anyway. 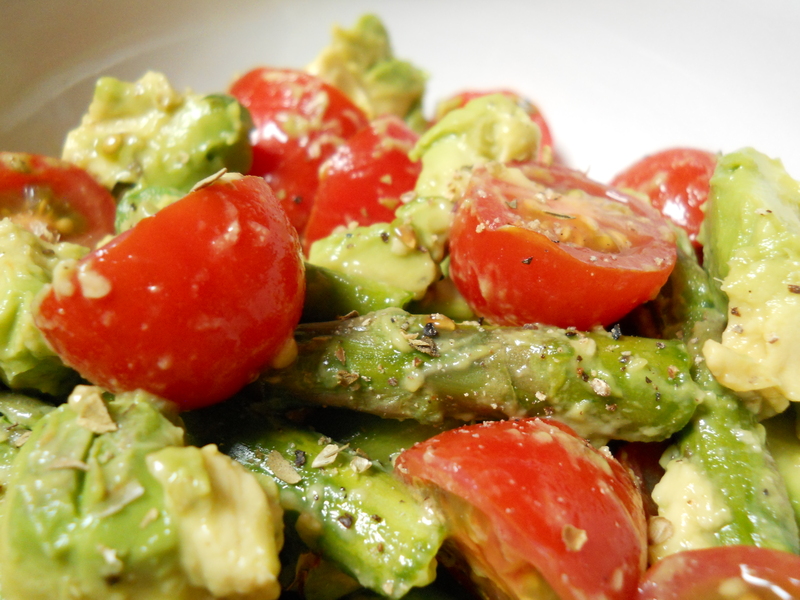 Avocado is one of my favorite foods. This is a good dish to take to a barbeque or just for lunch, to shake things up. I can’t wait to try this again with the addition of fresh basil! After seeing variants of this recipe floating around, I decided to try it out too. Result? Deliciousness that didn’t last for leftovers. Heat olive oil in a large pot over medium heat. Add onions and cook about 5 minutes or until soft. I mixed the ground ginger with the minced garlic and then added and cooked for about a minute. Add sliced apples and diced carrots and cook for 3 minutes. Blend the soup until smooth. My favorite way to do this is to yell, “Hey Dad, want to immersion blend something?” and then he comes running because immersion blending is his favorite thing to do in the kitchen. Add some water while your dad is immersion blending to thin it out to your desired consistency. I personally like thicker rather than brothy soups. Add a pinch of nutmeg, salt, pepper to taste. Serve with a drizzle of quality olive oil, some pepper, and another tiny pinch of nutmeg. 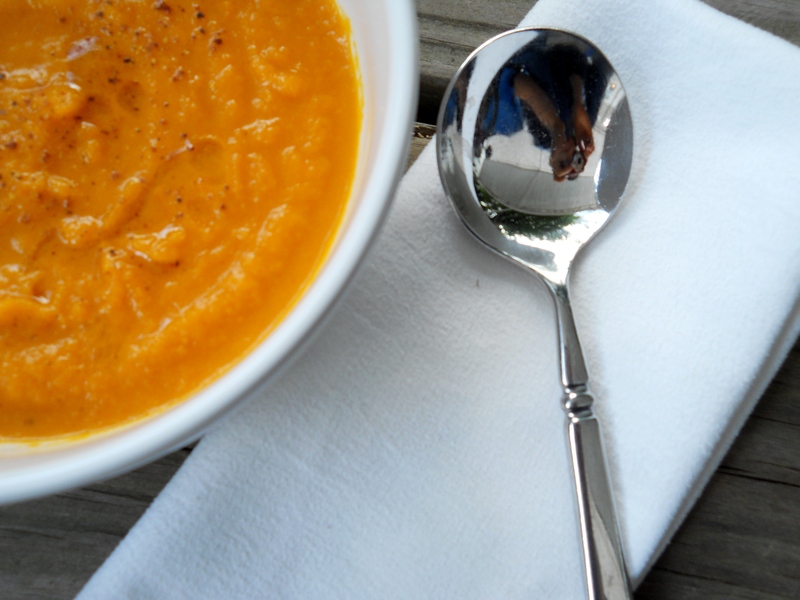 Apparently the soup freezes well but you’d never know… because it shall be devoured. Definitely double this recipe for good sized portions. Wow, that’s a lot of carrots.